The National Association for Child Development and the NACD Foundation Announce the Appointment of Kaitlyn and Lisa Law as NACD’s Ambassadors for Down Syndrome. 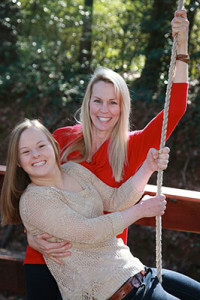 We are happy to announce that Kaitlyn Law, a 23-year old young lady with Down syndrome, and her mother, advocate, and cheerleader, Lisa, have been appointed as the Foundation’s Ambassadors for Down Syndrome. Kaitlyn is a bright, happy college student, attending USC Aiken where she often speaks to special education students about Down syndrome. She also enjoys speaking to parent groups about the benefits of swimming for special needs children and adults. Kaitlyn is a competitive swimmer, voracious reader, works with children at a day care center for at-risk children, and enjoys a great relationship with her boyfriend, Nathan. Nate and Kate are two delightful NACD young adults and are an inspiration for us all. During 2014 NACD will be focusing efforts on changing the perceptions of parents, the general public, and professionals about individuals with Down syndrome, and helping to provide these children and adults with real opportunities that are commensurate with their innate potential. Another of our goals is to help educate expectant parents who are often ignorant or misinformed as to the potential of individuals with DS. Abortion of Down syndrome babies is still being encouraged. In the United States an alarming 67% of fetuses with probable DS are aborted, and in the United Kingdom and Europe that number is an incredible 92%. We believe that in the majority of cases, there is simply a lack of knowledge and understanding on the part of the parents, and a lack of education on the part of the professionals. The National Association for Child Development works with families of children with Down syndrome internationally and is acuity aware of the difficulties facing the families of these children. General parental and community education is sorely lacking. There is inadequate dietary, medical, neurodevelopmental, therapeutic, educational, social, and vocational guidance and assistance. NACD, whose headquarters are located in Ogden, Utah, was established in 1979 and has Chapters around the United States and internationally. NACD has been instrumental in creating neurodevelopmental and educational methodologies and in disseminating information. NACD has worked internationally with many thousands of children and adults with Down syndrome, helping to unlock their true potential. The history of Down syndrome is marked with children and adults who have been denied a real opportunity to participate in developing and achieving their innate potential. The model for the world’s perception of individuals with Down syndrome is based not on the innate potential of these wonderful human beings, but is a reflection of the failure of our educational and medical communities to meet their needs. Today more and more individuals with Down syndrome are demonstrating their potential, graduating from high school, attending college, starting businesses, being gainfully employed. Many have wonderful social lives and are assets to their loving families and communities. This is the potential; but unfortunately our society is failing most of these children and adults dismally. Low perceptions of potential tend to lead to self-fulfilling prophecies. Kaitlyn and Lisa Law will be traveling around the United States and internationally, speaking to parents and organizations, helping to increase awareness and change perceptions, teach acceptance, understanding, value, and inclusion, and to help save lives. In addition the Ambassadors will be helping to build a community of professionals to help NACD in its mission to develop better biomedical, dietary and nutritional, developmental and educational methodologies. But first and foremost, NACD’s International Ambassadors for Down Syndrome will be focusing on parents and families, helping to teach them how to assume the responsibility for their children, and showing them how to take charge and become their child’s advocates. Kaitlyn and Lisa will be helping us unite and network our NACD families with Down syndrome children, and through our NACD DS community provide support, knowledge, good will, and hope. Our families with Down syndrome children and adults who wish to network, participate, and help can contact Kaityn and Lisa at DSAmbassadors@nacd.org.